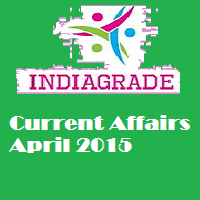 Current Affairs 7th April 2015: Now a days candidates preparing for any government examination are interested to know the daily updates in world, India, Political, sate wise updates, sports updates etc. Huge amount students are working very hard to clear the IBPS, UPSC, SSC and other top competitive examination. Before going to study you must plan correctly and do your work. Without perfect planning we can't achieve the goal. Even though many workers also looking to go with bank jobs, railway jobs, government jobs. So you are one person interested to prepare, just follow INDIAGRADE website. We provide interview aptitude question for preparation. Today(Tuesday, April 7) is WHO(World Health Day). Arkansas woman dies at 116 days after being declared the world's oldest person. UNICEF says 74 children dead in Yemen fighting. Haryana Chief Minsiter Manohar Lal Khattar Gives 6 Months to Officers to Give Up Corruption. The Delhi police arrests most wanted gangster Neeraj Bawana today. Jammu and Kashmir CM Mufti Mohammad Sayeed meets PM Modi to explain situation of J&K. Maharashtra govt makes screening of Marathi films between 6PM to 9PM at Multiplex Theatre mandatory. Andhra Pradesh(AP) Police kills 20 red sandalwood smugglers in forests of Chittoor. IPL 2015: The IPL 8 opening ceremony organized today. Bollywood stars Hrithik Roshan, Shahid Kapoor and Anushka Sharma to perform in opening night. Sri Lankan pace bowler Chanaka Welegedara equals T20 world record. He bowl 4(overs)-2(maiden)-2(runs)-4(wickets). Rajeev Shukla returns as IPL governing council chairman.